Steven Tyler said Aerosmith was finishing two final songs for the album, its first since 2004's Honkin' on Bobo. Joined by Joe Perry, Tom Hamilton and Joey Kramer at a Los Angeles mall, Tyler revealed three track titles: Legendary Child, Beautiful and Out Go the Lights. 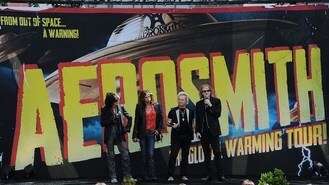 Earlier in the week, the band announced that its 18-stop Global Warming Tour begins on June 16 in Minneapolis. "We will not let you down," Tyler told reporters and cheering fans. The American Idol judge is engaged to model Erin Brady. Asked about what will be his third marriage, Tyler said: "I cannot stop falling off stage and falling in love."